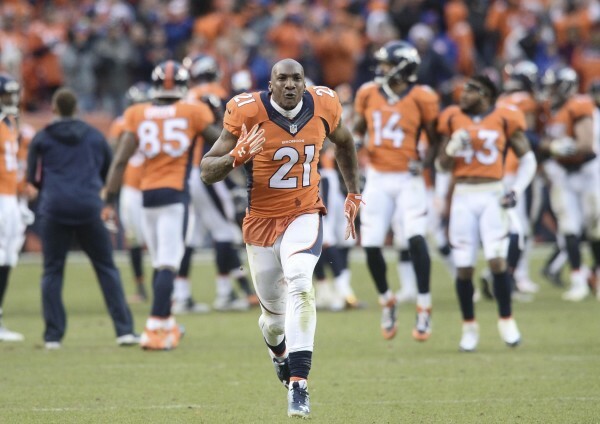 Denver Broncos cornerback Aqib Talib (21) celebrates in the closing seconds of the AFC Championship football game at Sports Authority Field at Mile High in Denver Sunday. 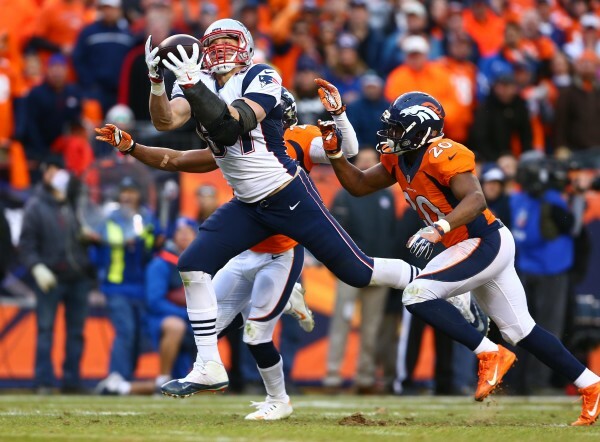 Denver defeated New England 20-18 to earn a trip to Super Bowl 50. New England Patriots tight end Rob Gronkowski (87) catches a pass and is tackled by Denver Broncos free safety Josh Bush (20) and cornerback Chris Harris (25) in the fourth quarter in the AFC Championship football game at Sports Authority Field at Mile High in Denver Sunday. New England Patriots quarterback Tom Brady (12) is sacked by Denver Broncos outside linebacker Von Miller (58) in the second half in the AFC Championship football game at Sports Authority Field at Mile High in Denver Sunday. enver Broncos quarterback Peyton Manning (18) scrambles for yards during the second half in the AFC Championship football game at Sports Authority Field at Mile High in Denver Sunday. New England Patriots quarterback Tom Brady (12) reacts after a failed fourth down conversion against the Denver Broncos in the fourth quarter in the AFC Championship football game at Sports Authority Field at Mile High in Denver Sunday. 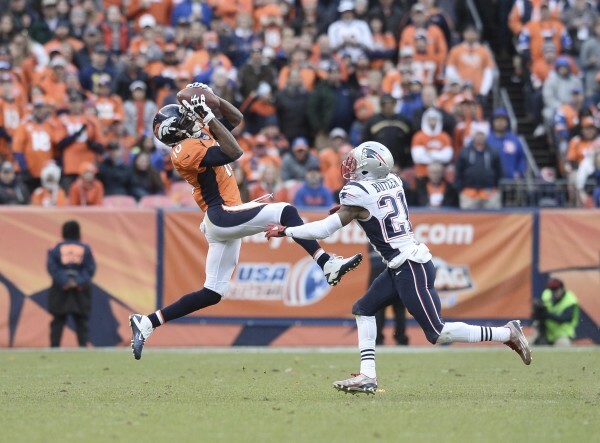 Denver Broncos wide receiver Emmanuel Sanders (10) makes a catch over New England Patriots cornerback Malcolm Butler (21) during the second half in the AFC Championship football game at Sports Authority Field at Mile High in Denver Sunday. 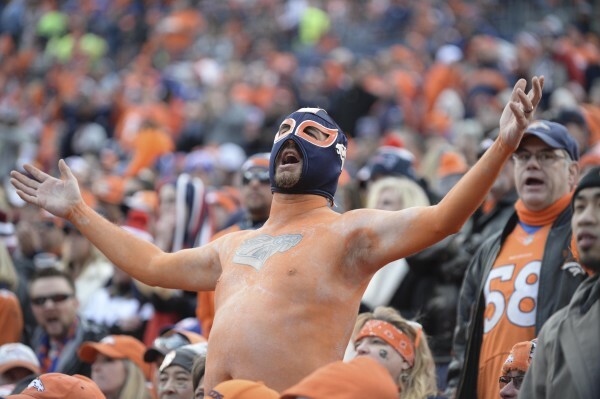 A Denver Broncos fan cheers on his team during the second half in the AFC Championship football game at Sports Authority Field at Mile High in Denver Sunday. DENVER — Peyton Manning carried the load early, and the Denver Broncos’ defense handled the rest. Manning threw two touchdown passes to tight end Owen Daniels, and Denver’s defense came up with three critical stops late in the fourth quarter as the Broncos beat the New England Patriots 20-18 Sunday to advance to their second Super Bowl in three years. 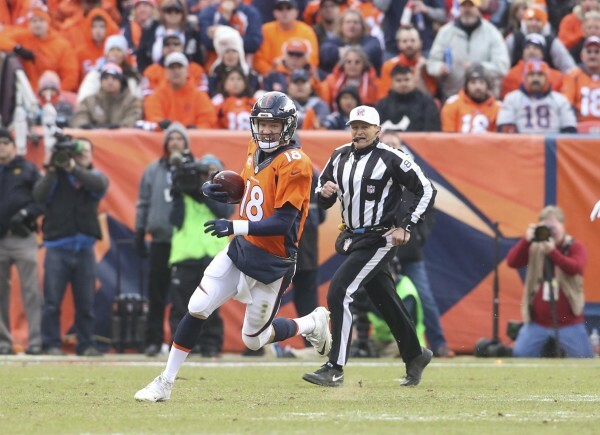 Manning tipped his hat to his defense for the return trip to the Super Bowl, where the Broncos will try to win their first championship in 16 years and Manning will try to win his second. “They’ve been challenging to go against in practice, going back to training camp, but it is special to watch them work and watch them perform on Sunday,” Manning said. The Broncos will take on Carolina in Super Bowl 50 after the Panthers pounded the Arizona Cardinals 49-15 in the NFC final Sunday night. Denver coach Gary Kubiak said the Broncos win epitomized the style of football the Broncos established throughout the season, winning close games with bruising defensive play and just enough scoring punch from the offense. Manning outdueled Patriots quarterback Tom Brady in their fabled rivalry with a huge assist from the defense, led by linebacker Von Miller’s 2.5 sacks and interception. Trailing by eight at halftime, the Patriots pulled within 17-12 on kicker Stephen Gostkowski’s second field goal, a 38-yarder with 10:38 remaining in third quarter. Denver managed to add a field goal by kicker Brandon McManus, a 31-yarder with 10:02 left to play after Manning slightly overthrew wide receiver Jordan Norwood in the center of end zone on third-and-goal from the 13. Brady’s pass in the flat to wide receiver Danny Amendola was stopped for a 1-yard loss. 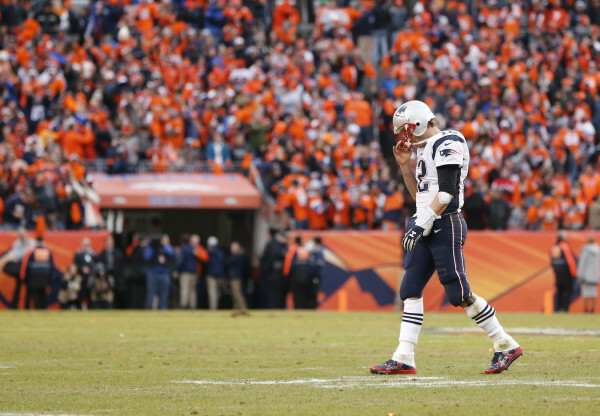 After forcing a Denver punt, the Patriots took over at their own 29 with 4:35 remaining. Again, Brady moved New England downfield, getting a big chunk with a 28-yard pass to tight end Rob Gronkowski. Facing a fourth-and-6 from Denver’s 14-yard line with 2:18 remaining, the Patriots again went for it, and Brady, backpedaling and under duress by Denver’s pass rush, threw incomplete to the triple-covered Gronkowski in the end zone. Denver again was held without a first down, and the Patriots, using timeouts and the two-minute warning, got the ball back at midfield with 1:52 remaining for one last possession. On fourth-and-10, Brady threaded the needle between two defenders for a 40-yard completion to Gronkowski to set up a first and goal at the 10. Wide receiver Julian Edelman caught a 6-yard pass between a pair of incompletions before Gronkowski’s leaping touchdown grab over cornerback Chris Harris pulled the Patriots within two points with 12 seconds remaining. Needing a two-point conversion to tie — Gostkowski missed an extra point in the first quarter, his only miss all season — cornerback Aqib Talib tipped Brady’s conversion pass, and it was intercepted by cornerback Bradley Roby. Broncos backup safety Shiloh Keo recovered the ensuing onside kick. Manning was sacked three times and completed 17 of 32 attempts for 176 yards. Brady, who fell to 2-7 all-time at Denver, was 27 of 56 for 310 yards with one score and two interceptions. He was also the team’s leading rusher with 13 yards on three carries. McManus drilled a 52-yard field goal in the final moments of the second quarter, giving Denver a 17-9 halftime lead. Gostkowski had a 46-yard field goal midway through the second quarter after a Patriots drive stalled when Miller and DeMarcus Ware combined for a third-down sack of Brady. Earlier, with Miller dropping into coverage instead of rushing the passer, the Broncos linebacker intercepted a Brady pass intended for Gronkowski and returned it 4 yards to the Patriots’ 16-yard line. Two plays later, Daniels slipped past linebacker Jamie Collins with a double move, and Manning lofted a pass from 12 yards out that Daniels caught up with in the corner of the end zone. The Patriots won a replay review to help set up their initial touchdown when it was determined that Manning’s pass parallel to the line of scrimmage in the flat to running back Ronnie Hillman, at first ruled incomplete, had traveled backward, allowing linebacker Jonathan Freeny’s recovery of the loose ball at the Broncos’ 22-yard line to stand. Running back Brandon Bolden turned a short pass from Brady into a 20-yard gain, and a subsequent personal-foul penalty set up a first-and-goal at the 1. Running back Stephen Jackson scored on the next play, but Gostkowski missed the extra point wide right. 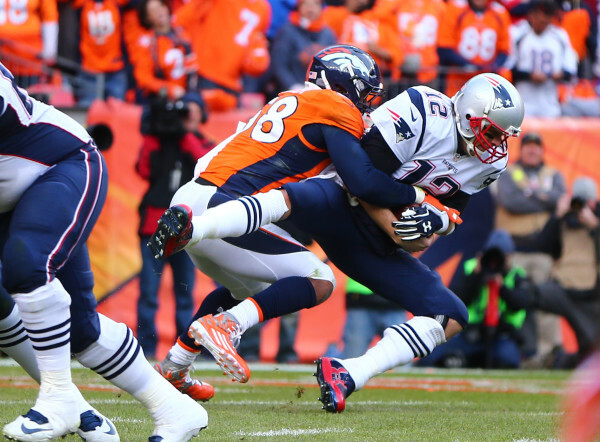 “We were happy we were still in the game the way we were playing offensively,” Brady said. Manning had the Broncos moving on their first possession, guiding them downfield before hitting a wide open Daniels down the middle for a 21-yard touchdown pass.